This is something I have said quite a bit -- and not just in college, when every Saturday night I was up too late for no good reason (though once in a while for a relatively good reason). I said it the most after we had children and moved to Bloomington. Regularly. Habitually. Each Sunday, I would wake up with so very many good intentions. The night before, as I drifted off to sleep, plans for the morning would have flitted through my mind: wake up before anyone else gets up, to squeeze in a shower and smell nice; make sure the babies eat breakfast and take a nap before church; clean the kitchen and start lunch. Most mornings, however, when the babies went down for their nap, so did I.
I was overcome with guilt. As a disciple of Jesus, then a pastor, and now a mother, responsible for the soul care of these babies, how could I miss church? I struggled, and still do sometimes -- with so many others, not only parents, but people in many walks and seasons of life -- with how and what it means to be a part of church, the body of Christ, the beloved community, in loving relationship with God and others. For some, the struggle with church was not a choice, and I recognize the ways that many are shut out for reasons around their gender and sexuality. I’ve felt that same rejection, too. For me, however, the struggle was not only about conforming in a certain way to fit in on Sunday mornings but also about what it means to walk the walk and talk the talk in all aspects of life. I’ve tended to think that my connection to God needed to be enacted in a certain way, like a checklist: church, Bible studies, choir practice, Sunday school, quiet times. But I’ve realized more and more that perhaps the most spiritual, even worshipful thing I can do is embrace my life as a mother. And I don’t mean a platonically ideal mother, but a snot-wiping, baby-chasing, diaper-bag-toting mother, embracing the ordinary and everyday as a sacred act. Because our faith and identity aren’t cultivated only by formal Bible studies, centering prayer, or the lectio divina (a traditional Benedictine way to read, pray, and meditate on Scripture slowly and intentionally), though these are good and wonderful. Rather, sometimes it’s the simple “help!” and “thank you” that build any relationship, whether with God or with children or spouse. It’s that simple. All this meant that I didn’t feel pressure to drag the twins and myself to church if it just didn’t work out, and it would be all right. Lightning would not strike us from above. So most Sundays, we’d stay home, in our pajamas, while the babies and I listened to their Pap’s sermons from previous Sundays on my iPhone. We banged rattles and cars. I sang “Spirit of the Living God” to them. I played some hymns on the piano. It felt good, but in the end, it wasn’t church -- not exactly. Though I felt moved and loved in the moment, and there was something inexpressibly spiritual happening those mornings, I was missing something. There simply is no substitute for gathering with the communion of saints each week, even if it doesn’t look like traditional church or the church of my childhood. In fact, many Christian communities do life together in unconventional ways. For example, there are the intentional Catholic Worker groups, where families buy a cluster of homes and truly share life together with weekly meals, meetings, and extending hospitality to the neighborhood, especially those in need. Some churches meet in coffee houses, movie theaters, community gardens, and bars. Some take a complete Sabbath at least one Sunday a month and worship on Saturdays, or they meet during the week or once a month, or online, or in video chats. All these out-of-the-box expressions of church demonstrate both that the core of church is ekklesia, being constantly called out, and that we also need to be called in, called to community, to be among our people regularly. People do church today in ways that are less and less distinct from “secular” culture -- that is, the rest of society, the stuff of the ordinary, everyday, mundane, regular spaces, actions, and gestures that fill our lives. The challenge is to carve out numerous spaces that allow for all these expressions of church -- whether it’s Sunday mornings at home with a podcast and piano, Thursday-night potlucks and a hymn sing, or sharing in the Eucharist at a dinner church service on a Sunday evening with a group of rowdy college students. While it’s hard for me not to think of church as only what happens on Sundays, specifically worship, I wonder if we’ve closeted the potential for living out that belovedness God intended not only for the body of Christ but for the whole human community at large. By lifting up the importance and necessity of church, we’ve constrained and forgotten how we are called to live in our neighborhoods day in and day out, in relationship with all the categories of people in our lives -- acquaintances, strangers, colleagues, peers, and friends. A queer spirituality dissolves those boundaries, and queering church means throwing open those doors and breaking down those walls, especially when it comes to participating in community life -- the way we gather together, the way we worship, the spaces we find ourselves in. Queering church means queering our faith lives, too, and those boundaries and legalistic expectations to check off the religious to-do list. Queerness opens us to a more thoughtful and meaningful perspective, a willingness to see the possibility in what is different: all the different seasons and struggles, abilities, multiplicities, and convictions of each individual. There isn’t one way to show up. And when we do show up, we don’t have to be functioning at the same level or pitch. There’s room for everyone’s needs. There’s room for everyone’s gifts. There’s room for everyone’s spiritual practices. There’s room for everyone’s visions. There’s room for everyone’s doubt. There’s room for everyone’s complexities. There’s room for everyone. I grew up hearing that church was the place where you could come with everything -- all your baggage. Yet it often felt as if we still needed to check certain bags at the threshold, or in church-speak, in the narthex. Anything negative or not pretty and shiny had to be sequestered, shut away, closeted. The unspoken message was “Don’t bring your sadness, doubts, criticism, hopelessness, angst, frustrations(unless it’s about the coffee or homeless people on the corner), and certainly not your anger.” Anger was the worst; it was the antithesis to any kind of social decorum, niceness, politeness, or respectability. Anger meant a lack of self-control and an excess of emotion, both of which were wholly undesirable. But I discovered I was angry. I couldn’t help it. All the time, I was angry at the world, angry at my (lack of) parenting skills, angry at how little time there was to think or reflect or write anything meaningful, angry at racism, angry at the church, angry at scarcity and shame, angry at the copious amount of dandelions peppering our lawn (one more thing on the to-do list for this suburban life), angry at sexism, angry at bigotry and prejudice, angry at violence and oppression, angry at extrajudicial killings of innocent black bodies, and angry at my exhaustion. In many ways, I’m still angry. “Some anger is good,” I hear people say. “Anger can give you the fuel you need to do the work, to bide the course, to keep the steam going and stay in the fight.” Anger certainly does that for me, but I found that if it is all that’s there, if anger alone is fueling the work each day, then something in me hardens, and the anger turns into cynicism, rather than something useful. Though the anger gave me energy when I was speaking into the darkness, something shifted when I felt swallowed up by it. I found I was tired. I don’t mean just the “I haven’t had normal sleep in over five years” kind of tired, nor the “My long run of the day is killing my feet, so I need new Brooks running shoes” kind of tired, nor the deadlines-coming-out-of-my-ears kind of tired. And I mean more than the emotional and physical exhaustion of keeping up with the schedule of children, whether preschool or college aged. Rather, in a feeling that persists today, I was tired of maintaining anger as if that were the only nourishment for this life. I was hungry -- seriously, on my hands and knees famished -- for something else. I longed for peace. Thankfully, peace is persistent; it won’t give up on me, even if it shows up in the queerest ways. Last year, a friend from high school painted me a modern version of an icon of Saint Margaret. This queer icon, a beautiful rendition of Saint Margaret with an Asian face, kneeling in cutoff jeans, a basket of bread in one hand and a chalice in the other, tattoos of a labyrinth on one arm and the Chinese character for journey on the other, a dove hovering nearby -- she is my pillar of cloud by day and fire by night. Saint Margaret of Cortona is the patron saint of the disenfranchised and the marginalized. She began working with this population after losing the love of her life. She is the possibility of a life lived radically, messily, and hopefully, in peace and in pursuit of peace, of peacemaking. She helps me imagine how to deliberately confront and co-opt anger -- not letting it consume me, but not diminishing it or belittling it or trying to dress it up as something it is not. When tempered with the desire to surrender to peace, I can see anger produce the beginning glimmerings of a kind of wholeheartedness. The pendulum swing between the struggle with anger and a longing for peace finds its equilibrium in knowing I am enough -- that who I am is enough for the writing, the speaking and preaching, the parenting, the mentoring and ministering, the working that I do. Who I am is enough for these seasons, for this moment, for this living. Queerness is found in these spaces in between. Healing makes space for all of our emotions -- the wide, varying spectrum, the multiplicities, complexities, the ineffable and inexpressible. The work of peacemaking means allowing for all of it, realizing it will never be easy or pretty, simple or straightforward, linear or formulaic. My living into queerness is rooted in belovedness and the beloved community. A queer spirituality makes space for cultivating belovedness, and queerness is a way to understand how wholeheartedness makes space for all of our emotions and experiences. Some days still call for a return to the warmth of heavy quilts more than they call me to the sanctuary. But I will take a cue from my guide, Saint Margaret, to believe that peace isn’t always accompanied by a feeling, but that it is a symptom of wholeheartedness. I will learn to trust the scars and markings of the journey on my life, to keep feeding and being fed by others, and to trust the presence of the Holy Spirit. I will keep on seeking and living that peace, because it will sustain my life. I will listen and wait, and let myself be astonished and nourished by the queer ways that peace, hope, joy, and most of all, love show up. 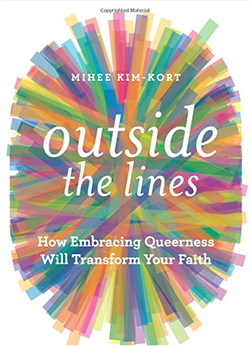 Adapted from “Outside the Lines: How Embracing Queerness Will Transform Your Faith” (Fortress Press, 2018), by Mihee Kim-Kort. Reprinted with permission.